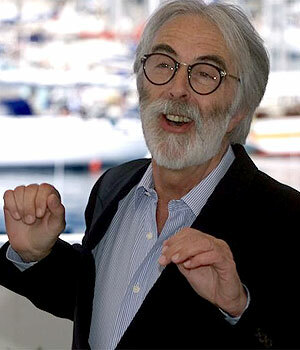 Michael Haneke appeared on The Bat Segundo Show #316. Mr. Haneke is most recently the director of The White Ribbon, which opens in theaters on December 30th. 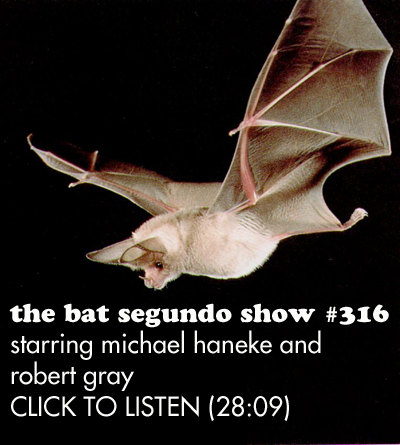 The Bat Segundo Show expresses profuse gratitude and thanks to translator Robert Gray for assisting in this conversation, which is presented here in German and English. Condition of Mr. Segundo: Tying a white ribbon ’round the old oak tree. Subjects Discussed: The roots of human behavior within Haneke’s films, the film as a ski jump, the relationship between the cinematic spectator and semiotics, the spectator’s lack of freedom, the director as god and Martin’s spared death on the bridge, the baroness’s moral choice, truth and the denial of inherent human nature, Anna Karenina, social status and imprisonment, terrorist acts that are tied to specific occupations, the mistreatment of young children, planning a film for open-ended interpretation, whether or not a film can be entirely calculated for the spectator, the use of the Z-axis to accentuate a prewar setting, the perception of daily life, the role of the police in Haneke’s films, the trouble with dramaturgical constructs, and the impracticalities of theory in everyday situations. Correspondent: In Funny Games, you have a scenario in which we don’t actually understand the motivations of the two killers. Cache, same thing. The actual motivation behind the videotapes is not entirely spelled out. And, of course, in The White Ribbon, we have a similar situation in which its more about the consequences than it is about the origins. And I’m curious why your films tend to not dwell upon the origins of terrible acts, as opposed to the consequences. Do you think that looking for the root cause of human behavior is a folly? At least with these particular characters in your film? Haneke: (through translator) Mainstream cinema raises questions, only then to provide immediate answers so that the spectator can go home feeling reassured. But I think if film is to take itself seriously as an art form, then, like every other art form, it has to allow the spectators a certain freedom of possibility — of investing themselves, of grappling with the issues that are involved, of bringing their own feelings and explanations to the work that they are receiving. I always say that not only film, but every art form should provoke the spectator so that they feel motivated. The work has to be constructed in such a way that the spectator is led to investing himself in search for his own answers. I always say that not only film, but books too, are like ski jumps. They have to be built in such a way that people can jump properly. But the film is the ski jump and it’s up to the spectator to jump. Nice interview. Interesting for seeing how much time translation takes up. (I gather Haneke speaks some English but didn’t feel confident enough to give full answers in that language.) Also, interesting for seeing how Haneke wants to leave certain issues open for viewers to do the work. He respects his audience and thinks they don’t have to have everything spelled out for them. Refreshing. The film critic of the Guardian newspaper in the UK has selected his top 100 movies of the “noughties”. The White Ribbon rated very high at Number 5.